Since 2009 official per capita sales of alcoholic drinks went down by 9%. Up to 500,000 Russians die annually of causes related to the excessive use of alcohol, Rospotrebnadzor consumer rights' watchdog reports. 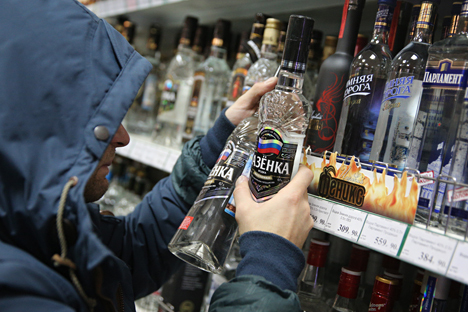 "Experts say that in Russia alcohol abuse causes the premature avertable death of about half a million people every year, resulting in a mortality rate of about 30 percent of men and 15 percent of women," Interfax was told at the press service of the authority on Jan. 19. Quoting statistics it said that since 2009 official per capita sales of alcoholic drinks in absolute alcohol went down by almost 9 percent from 9.1 liter in 2009 to 8.3 liter in 2014. "In 2009 through 2014 the number of patients registered with alcoholism for the first time dropped by 28 percent. Besides, the number of registered alcoholics at medical institutions also went down by 11 percent," the authority reported. Rospotrebnadzor said that alcohol-related death rates have declined in the past few years. "The statistics of the past few years indicate that youngsters become alcoholics due to the consumption of beer or low-alcohol beverages: 33 percent of young men and 20 percent of young girls use alcohol daily or every other day," the service said. In 2012 Gennady Onishchenko, the then head of Rospotrebnadzor, said that Russia had three million alcoholics. He said that several million more Russians have not been diagnosed as alcoholics but cannot live without regularly drinking alcohol.